PursuePoint is an advertising-supported program which might get onto computers of those users who use Windows operating system. 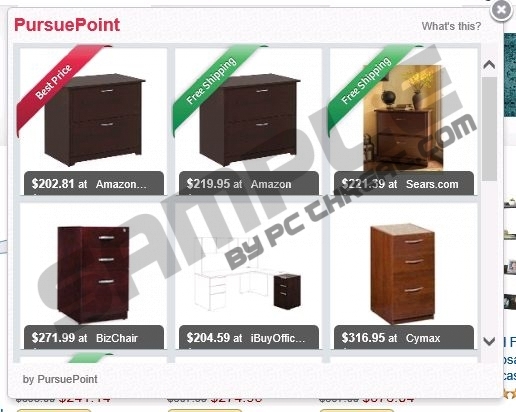 As you might have probably understood from its name, PursuePoint is going to show you various advertisements when you browse the web, especially such online shopping websites as ebay.com, amazon.com, and walmart.com. You will not be able to stop these ads whenever you want because they work on all the major browsers, including Internet Explorer, Google Chrome, and Mozilla Firefox; thus, switching the browser will not help you at all. The best what you can do is to erase PursuePoint from your system entirely. What is more, PursuePoint is inseparable from various advertisements. Even though it claims that it is going to provide you the best tools to enhance your browsing experience, the most what it is going to do is to show various coupons, deals, and price comparison ads. You are also going to see in-text and interstitial ads. Of course, it is up to you whether you want to see those advertisements; however, we highly recommend not clicking on them. If you do so, you might be redirected to the websites whose content is unknown, which means that you might encounter various threats. Are you ready to get rid of PursuePoint? We will help you to do that. Follow the instructions which you will find below and you will experience no difficulties regarding the removal process. If you are a less experienced computer user, you can also acquire a reliable antimalware tool, for instance, SpyHunter. It is going to do all the job for you and you will not need to bother whether there are no other threats on your system. Besides, it will block the way for various future infections. Click on Start to open the Start menu. Find the Control Panel and then select it. Locate the program which you want to get rid of. Select Uninstall a program to access the list of programs. Right-click on the unwanted application. Access the Metro UI button (press the Windows key). Type Control Panel and then select it when its icon appears. Right-click on the PursuePoint on the list. Quick & tested solution for PursuePoint removal.